Manx National Heritage is pleased to announce the opening of its latest exhibition, Island Paintings by Edward Kelly, at the House of Manannan, Peel on Saturday 30th June 2012. The exhibition will feature a collection of large and dramatic paintings which celebrate the artists long association with the Island. Edward Kelly has spent the past 40 years drawing inspiration from the Manx land, seascape and carved Celtic and Norse crosses. Edward Kelly was born in Liverpool, initially training at the Liverpool College of Art, with his work first being exhibited when he was 12 years old which resulted in the newspaper headline Bootle Boy Hung but more importantly prize money to spend on new brushes and paints. This exhibition will be Edward Kellys fifteenth One Man Show in an extensive career. Over the years, Kelly has been inspired by a variety of artists ranging from the 15th century Italian artist Piero della Francesca to 20th century Russian-American artist, Mark Rothko. Following in the tradition of many Manx artists, Edward Kelly has combined a career as a working artist together with teaching, twenty five years lecturing in painting and inspiring the next generation, including the Manx artist, Paul Ford, at the Chelsea College of Art. He resigned his teaching post in 1996 to concentrate on his studio work. 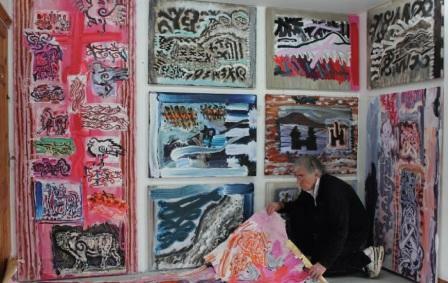 The very latest work in the Island Paintings has never been exhibited before or indeed seen as a totality by the artist, being too large for his studio. This is a vast polytych on twenty six panels called Moments, an epic island poem derived from images that have haunted him for thirty years. As well as the Island Paintings exhibition at the House of Manannan, there will also be a second display of Edward Kellys work at the Manx Museum, on the singular theme of Seascapes placed in the context of other seascapes by artists represented in the National Art Collection. Context is all important in painting says Kelly. Visitors to the Manx Museum will also be able see a film Making Paintings, about the artist and his work in the Lecture Theatre. This relates the reasons and technical process of making the paintings on show as well as a glimpse of other works not represented in the exhibition. Edward Kelly has travelled extensively drawing inspiration and making work from a variety of cultural sources notably Greek and Egyptian. A very different history and a different spirit of place is represented in Herefordshire with a large monumental series of paintings celebrating the life and ministry of the 6th century saint, St Dubricius installed in an important pilgrimage site, recently dedicated by the Bishop of Hereford. The exhibitions Island Paintings at the House of Manannan, Peel and Seascapes at the Manx Museum, Douglas open to the public on Saturday 30th June and continue until October 2012.